Gardening – Pull your weeds, not your back! Don’t wear clothes that are tight or constrict your movement. Keep yourself warm and covered in the cold. Don’t over-expose yourself to long periods in the sun. Gardening is like any other exercise; you need to warm up first. Don’t go straight into heavy garden work, start off with lighter jobs first. This will lessen the chance of muscle strain. If you have to use a ladder for any of your gardening tasks, make sure you are always facing it. Rather than lean or reach, move it regularly. When using the ladder, always keep your shoulders, hips and knees pointing in the same direction. Make sure the ladder is firmly and safely planted in position and, if possible, have someone else standing there to keep an eye on things. Get as close as possible to the things you are pruning; avoid overstretching to reach the area you are dealing with. 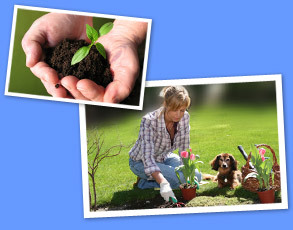 Invest in some long handled secateurs to reach plants and bushes that are beyond normal reach. Vary your activity; spend no more than 20-30 minutes on any one thing and take regular breaks. Switch hands frequently when doing repetitive actions. If using a hover mower, try to resist the temptation to swing the mower from side to side. 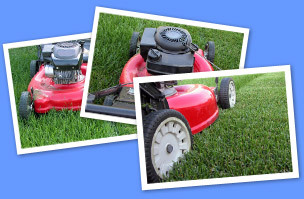 Instead, mow forwards and backwards as you would with a conventional cylinder mower. If laying a patio keep the slab close to your body and bend your knees. It is sometimes better to bend one knee rather two, as your supporting leg gives you a position of strength. If using railway sleepers, two people will probably be needed. If you are planning a trip to the local DIY store and buying heavy items, such as cement or gravel, buy smaller bags rather than one big bag as they are easier and safer to carry. If you do buy heavy items, ask an assistant at the store to help you. Shovel the contents of large bags straight into smaller containers or wheelbarrow from the back of the car. A specialist garden trolley might be worth investing in to move these sorts of materials around, especially so if you have lots of patio pots to move around as well. If you ache the next day there are ways to alleviate the discomfort: application of a cold pack, arnica, stretching exercises etc. Please contact us if you need further advice.